Pozament offers one of the widest choices of sprayed concrete formulations, augmented by a bespoke product development service. Featuring specially developed binders to reduce clogging and cut down on rebound, the Pozament sprayed concrete range provides concrete contractors with a broad spectrum of uses. The problem with marketing such a range, however, is that one formulation of sprayed concrete looks pretty much like every other. A grey coating, applied with a good deal of noise and mess from a high powered spray nozzle. So instead of focusing on the product itself, we looked for other ways to get across the sheer number of applications Pozament formulations can be used for. A little homework led us to a number of industry case studies, from a skate park in North London to major underground transport networks. In each case, Pozament had been chosen not just for its technical performance or the money it saved by reducing waste at the nozzle, but also because it ultimately made for more robust mine and tunnel engineering works or safer, longer lasting play areas for kids. Armed with is information, we set out to find a distinctive and succinct way of communicating it to the industry. One that would really stand out against the monochrome environment of the trade press. The answer lay in a highly graphic single line illustration style that depicted the spray hose itself forming images of the projects Pozament sprayed concrete had been used in. 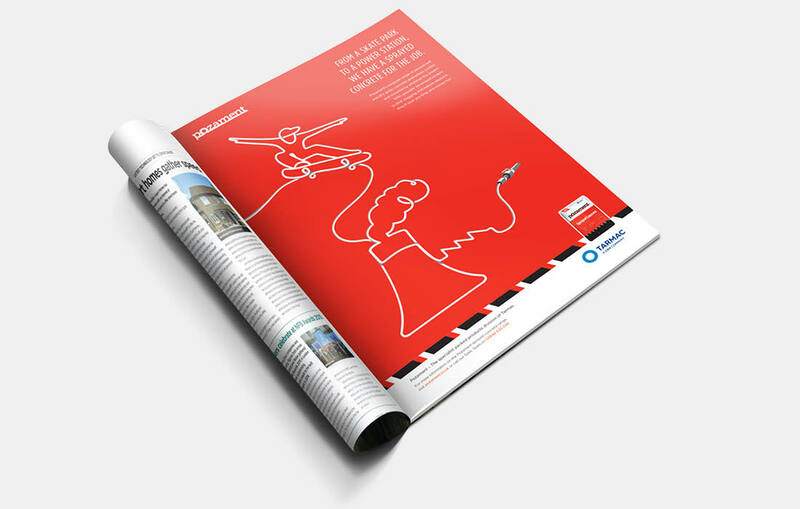 Set against one of Pozament’s vivid house colours, our work created an unmissable message, drawing out the case for choosing Pozament in the specialist press and at exhibitions and trade shows. 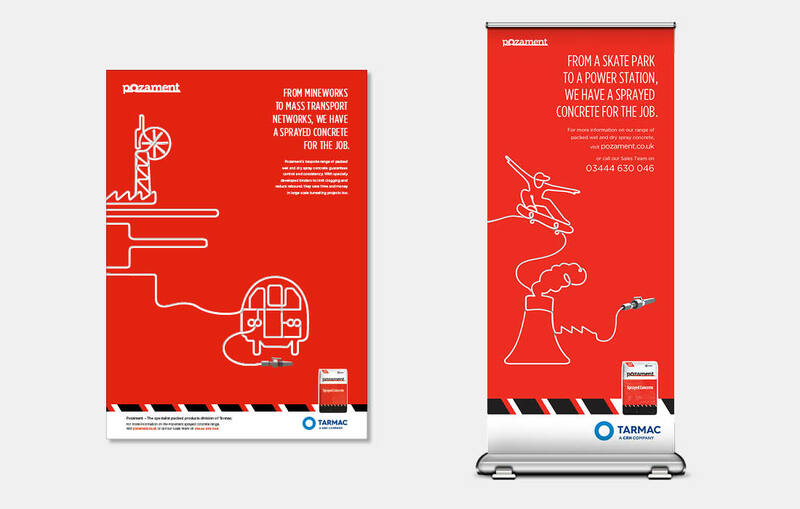 Construction press advertising – Specialist titles in the concrete and tunneling industries, reaching key contractor and specifier audiences with a visually arresting yet technically compelling message. Exhibitions and trade shows – An ideal backdrop for the Pozament exhibition stand, setting it apart from other run of the mill graphic treatments and prompting recall with its eye catching and individual design.